Cameroon has developed rapidly since attaining independence in 1960 largely by virtue of its modest oil reserves and excellent agricultural conditions. The developing West African country is fortunate to have one of the best endowed natural commodity economies on the continent. It has a low GNI per capita of US$1,170 (2012), but has seen GDP growth of 3.5% per annum (2008-12). 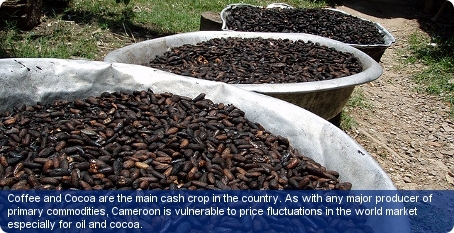 As with any major producer of primary commodities Cameroon is vulnerable to price fluctuations in the world market especially for oil and cocoa. Agriculture, forestry and fisheries combined contribute a significant 25% of Cameroon’s GDP (2010). Most agricultural exports are destined for the European Union: cocoa, cotton, coffee, bananas, rubber and palm oil. Over 60% of the workforce is employed in the country’s agricultural sector (commercial and communal). Forestry contributes half of the 21% and is a significant form of employment, with over 30,000 people in the industry. Forests cover nearly half of the land area in Cameroon. Another large sector of the economy is manufacturing which contributes 17.3% of Cameroon’s GDP (2008). The main manufacturing activities are in petroleum production and refining, aluminium production, food processing, light consumer goods, textiles and ship repair. Douala is the largest manufacturing centre. The oil and natural gas industries do generate significant revenue, but it is slowly declining. Cameroon has around 200 million barrels of proven oil reserves and 135 billion cubic metres of proven natural gas reserves. There is no established industrial mining sector. Modest amounts of diamond and gold are produced from alluvial deposits for trading by the country’s artisanal miners. By the late 1980s the slow-down in growth forced the government into a series of economic reform programmes in 1990 which were supported by the IMF and the World Bank. State owned enterprises were either shut down entirely, streamlined or privatised in a concentrated effort to improve efficiency throughout the economy. The results were obvious by the mid 1990s as economic growth in Cameroon reached 4-5%. Further adjustment to the economy of Cameroon are envisaged as the IMF are pressing for more reforms such as budget transparency, further privatisation and poverty reduction programmes. Cameroon is the 3rd best country in Sub-Saharan Africa for getting electricity, according to the World Bank’s ‘Doing Business 2012’ study. But it is ranked 31st in Sub-Saharan Africa overall for ease of doing business. Over the years the country, like its African counterparts, has experienced brain drain which has resulted in a disproportionately well-educated emigrant population. Cameroon has an adult literacy rate of 68% and there are two provinces where a majority of the workforce speak English and eight provinces were most of the workforce speak French.